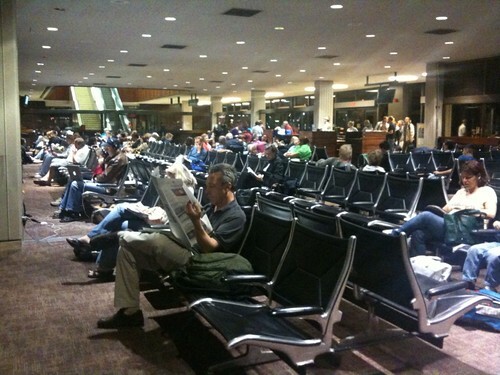 I’m at Gate 7 of Honolulu International Airport, about to board my redeye flight. I’m en route to SXSW Interactive. It’ll be my second year at this gargantuan geek fest, once again as part of the Wondermill delegation. I can’t wait to see old friends, make new friends, and fill my brain with a million things vying to be the Next Big Thing. For 2010, I’ll be chasing panels and startups doing interesting things with geolocation, and — fueled by the recent tsunami scare — people working on ways that social media can play a part in civil defense and emergency planning. I doubt I’ll find much time to blog, but you’ll be able to keep ridiculously close tabs on my adventure via Twitter. I’ll be checking in and leaving a digital trail of breadcrumbs for anyone to track my movements around Austin via Gowalla and Foursquare (and sporadically via BrightKite, Google Buzz, Loopt, Yelp, Plazes… you get the idea). And I’ll definitely be posting photos to Flickr. Like last year, there will be a fair number of Hawaii geeks represented (though the largest contingent of Hawaii delegates are focused on the music festival). I also may connect with a few local “LOST” fans, and most definitely do some music shopping with my good friend Greg. If you’ll be at SXSW, or in Austin, I’d be happy to connect! enjoying the trip along with you twitter!